After doing a hair history on Kelly O, I loved the way she was going with her hair. It was softer, but still had the edgy style she's known for. Fast forward to September 2012 and the hair is longer, the lilac/grey tones are back and I love it. I think it suits her complexion and has looked great against her red carpet outfits. It's something a little different, and I can't imagine her ever going back to a 'normal' colour now. I'd imagine to get this all over colour, Kelly has bleached her natural hair lighter, then added the dye to help give it a pastel finish. I prefer it to the stronger Grey look she sported a while back. The photo on the right is gorgeous and really shows how much she's changed through the years. 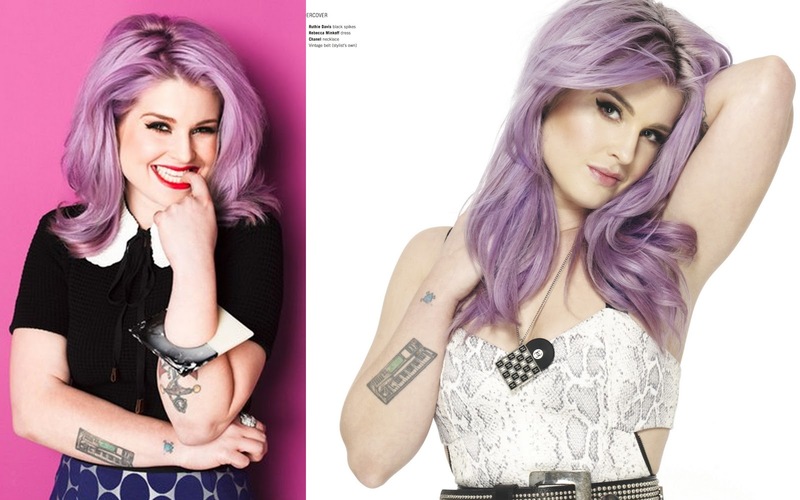 "To me, I'm 27, I've got three years left, the way I look at it, to have fun with it, because once you're 30, you look a right idiot walking around with like rainbow, bright colour hair all different things like that"
As always a strong opinion from Kelly Osbourne, do you think that once you hit 30 it's all sensible colours? What do you think of Kelly's hair? Inspiration to reach for the bottle? I love her hair too. I think it suits her because she's quirky in what she wears and she has the personality to match. I see a lot of people in the street who look past 20 with non natural coloured hair and on some people it looks odd to me. Mainly because their hair doesn't match their clothing style. I think for some they feel funky and quirky inside and they change their hair to match what they feel inside but they forget that to make it look okay the rest of their style should match of compliment too. I'm 34 and in my late teens and early 20's i used to have what i call 'wacky' hair. I was into clubbing and trance music in a big way and i had short spiky black hair (yikes). My next door neighbour called me, "The hedgehog". Now i feel that i also dressed to match this hair statement. Inside my head i would love to have wacky hair again but my lifestyle doesn't suit me styling myself to match what i feel i am inside, Which is in a way a shame, but it's practical. I say go for it if you want coloured or abstract hair or makeup. I don't snigger at anyone who does. I think it's more of a shame when people clone themselves to try and match current trends (Dip dye?! Flicked eyeliner, Bold red lipstick?) just because they think it looks good because it must if so many other people have hair/makeup that way. Kelly's hair is original. I think everyone should stay original. Great thought provoking post. Sorry for the long rant. I love her hair, wish I could get away with it!